I recently encountered one long-running session and several blocked sessions, all performing the same delete operation. A pipelined table function may be called from regular SQL using the TABLE collection expression, e.g. where ‘ABC’ and ‘DEF’ are the inputs to the function. Disclaimer – these are my personal musings based on very limited information, which I’m sure will rapidly become out of date as more details emerge over the coming months. After encountering this little annoyance for the nth time, I thought I should write it up once and for all, so it is committed to my electronic memory. This is a write-up of an issue I recently posted to the OTN discussion forum (https://community.oracle.com/message/12798407). I thought the associated test case was useful in demonstrating the issue, so is captured here for future reference. There were some useful replies to the OTN post, confirming my suspicions. The test was performed using Oracle Enterprise Edition 11.2.0.3.0 on Linux. 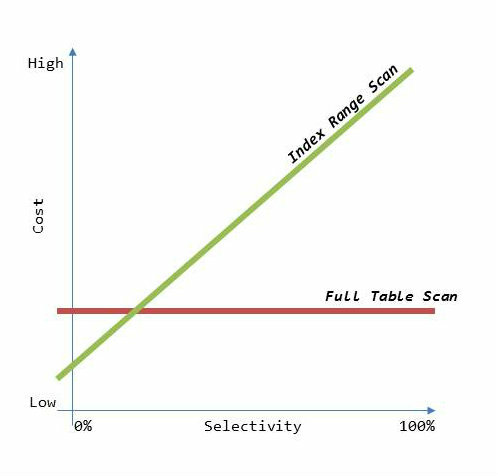 When trying to understand why the optimiser might choose not to use an index to read rows from a table, I find the following diagram helpful. The axis along the bottom represents the selectivity of the query (0% being no rows selected, 100% being all rows selected), and the axis up the side represents the cost of the chosen operation (more costly = more work to do). Here is a step-by-step analysis of the deadlock which occurs due to unindexed foreign keys. This analysis was performed on Oracle XE 11.2.0.2 – results may vary on other versions. A typical deadlock graph arising from an unindexed foreign key is as follows.